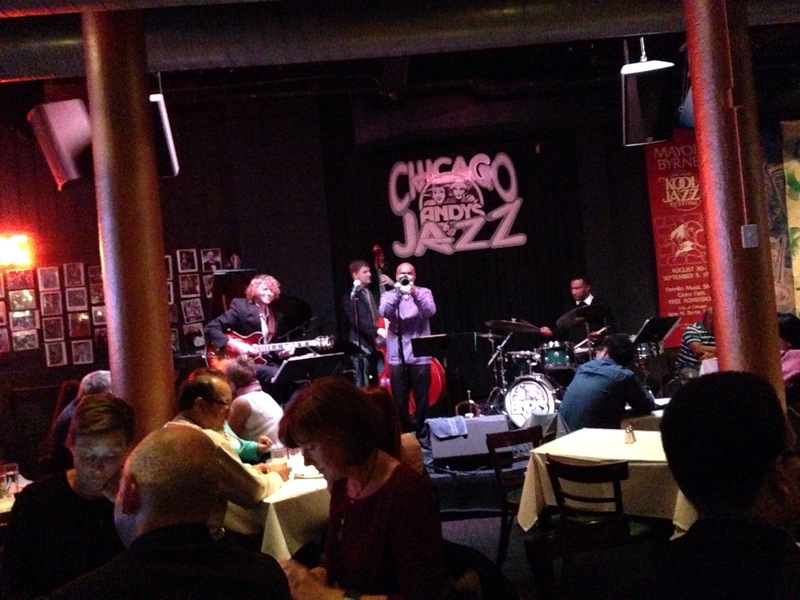 First set of the night at Andy’s Jazz Club. We were downtown and just a few blocks from where the real action was last night–the first annual Great Chicago Fire Festival, put on by one of my favorite theater companies, Redmoon. 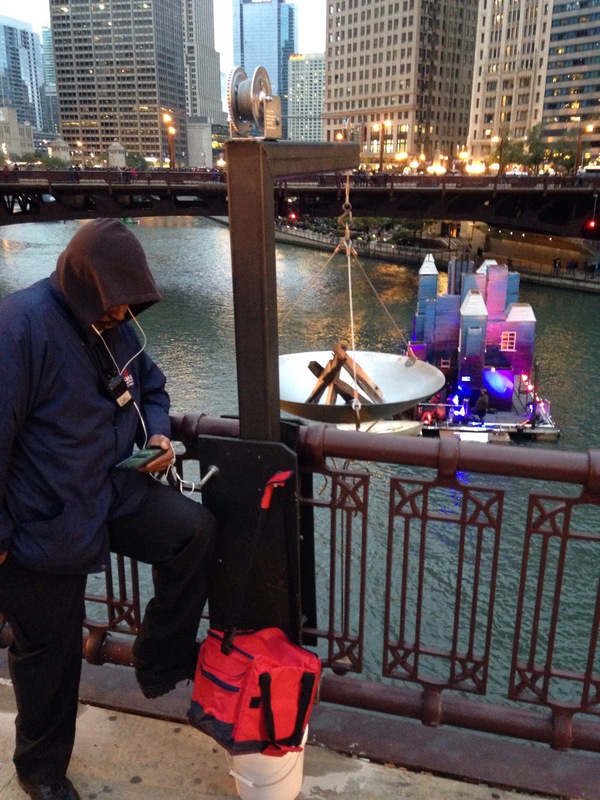 At about 6:30, crowds had already started to form along the Chicago River, between the Michigan Avenue and State Street bridges. I walked across the State Street bridge for a view of one of the floating buildings, due to alight at eight o’clock, when flaming cauldrons would be lowered from the bridges. Unfortunately, the weather (a tremendous amount of rain fell over the previous day) and technical difficulties prevented the building bonfires to go off as scheduled, and in some cases at all. By all reports, the flames were minimal and the pyrotechnics mostly confined to the brief fireworks display that was originally to follow the buildings burning away to reveal surprises hidden inside. Sadly, with such a lengthy delay and pathetic payoff, many disappointed spectators left early, missing a parade of grass boats (kayaks) that sounded like quite something to see. Guarding a cauldron and what turned out to be an inflammable prop house on the river. By the time I left the jazz club, the Fire Festival should have been wrapping up, however it had yet to burn. People were three-deep to the riverfront, and the bridge was packed with some standing on the metal railing dividing the pedestrian walkway from traffic. I couldn’t see a thing, nor was I willing (or able) to climb a tree, as some did, for a better view. Instead, we walked a few blocks over to Xoco and grabbed a churro snack–the best churros, anywhere, hands down–before beating the crowds home on the el. I’m disappointed the event didn’t succeed and feel bad for all the volunteers who put in many hours to create the spectacle. The floating buildings certainly looked impressive (and so Redmoonesque) but the execution was obviously flawed. We needed Robin Hood with a flaming arrow to save the day or at least tarps covering the structures, preventing them from becoming waterlogged in the rain. Hopefully the city will treat this as a dress rehearsal (albeit an expensive one) and make adjustments for next year. I’m sure the first Macy’s Day Parade didn’t go off without a few hitches. It was nice to see a cross-section of Chicago gathering together at the river, despite the unseasonable cold (there were snow flurries that morning!) 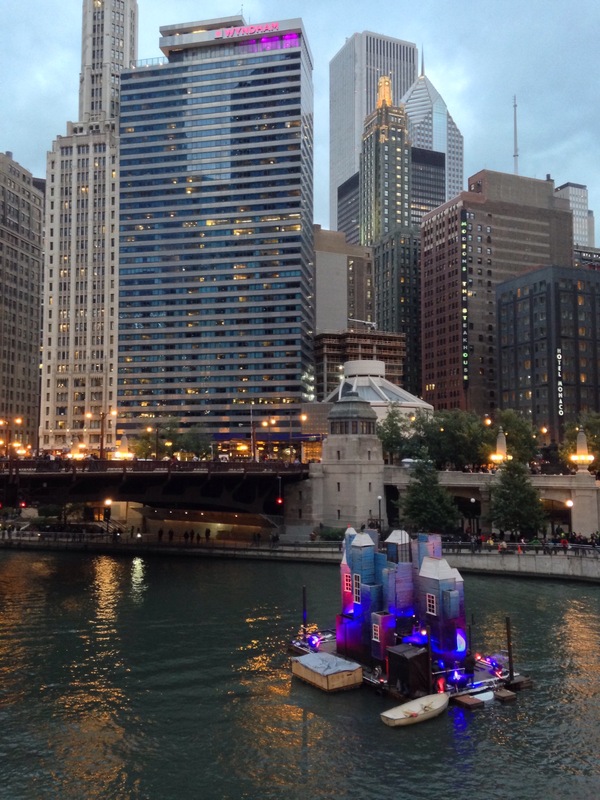 Colorful buildings floating on the Chicago River, set off by the amazing cityscape around them, were definitely something to see; it would have really been something had the spectacle ignited as planned. 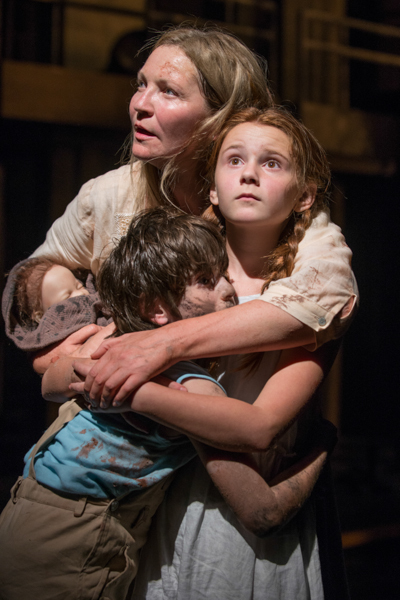 I started off my Steppenwolf Theatre season with a star-powered production featuring ensemble member Joan Allen in her first appearance here in over two decades. The Wheel, by Zinnie Harris, is the slightly surreal tale of a peasant woman caught up in war as she attempts to reunite an abandoned girl with her exiled father. The story begins during the Spanish Civil War and over the course of nearly two hours, morphs from one conflict to another, taking Allen’s Beatriz (now saddled with three children to protect) from the trenches to WWI through to the Iraq War. While it would be difficult for me to explain exactly what the play is about (other than to say, living through war is hell), any frustration I might have felt about the ambiguous narrative was kept at bay by Allen’s riveting performance. (She’s on stage nearly the entire time.) Acting across the board is top-notch, combined with a set and staging that is nothing short of incredible. Set pieces come in from every direction, and sound and lighting create eerie and arresting images of war. By the end, the stage has been transformed from a relatively simple and bright Spanish countryside, to the murky chaos of war. The stage crew certainly has its work cut out of it every night, having to clean up the mess and reset for the next show. I’d recommend The Wheel as a thrilling evening of theater that will give you lots to discuss over drinks after the show. Performances continue at Steppenwolf through November 10. I was sorry to see so many empty seats during last Friday’s performance of Head of Passes, an absorbing drama about calamity, grief, acceptance, and faith. While not perfect, the current Steppenwolf Theater main stage production, a world premiere by Tarell Alvin McCraney, is a thought-provoking and timely piece that deserves a wider audience. Set in Louisiana at the mouth of the Mississippi River, members gather at the family home on a stormy evening to celebrate matriarch Shelah’s birthday. A leaking roof and an unexpected guest (the woman’s doctor) are portents of doom. And then there’s the handsome stranger who’s hanging around, a smiling man only Shelah can see. Family and friends mix it up in a lively first act while water drains through the house from the roof and a slow tension builds. The story, based on the Book of Job, takes a slightly surreal turn in the second half. Shelah, who has resigned herself to one fate, is served up another, greater challenge, which tests her faith in ways she could never have imagined. Performances across the board are strong and well drawn but the undisputed star of this show is the phenomenal set by David Gallo. The first act concludes with a heart-stopping, thrill ride of a theatrical moment that on its own is worth the price of admission. Head of Passes runs through June 9. City Lit Theater in Chicago has launched an interesting undertaking to commemorate the 150th anniversary of the Civil War. Over the course of five theater seasons, they’ll produce a Civil War-themed play. 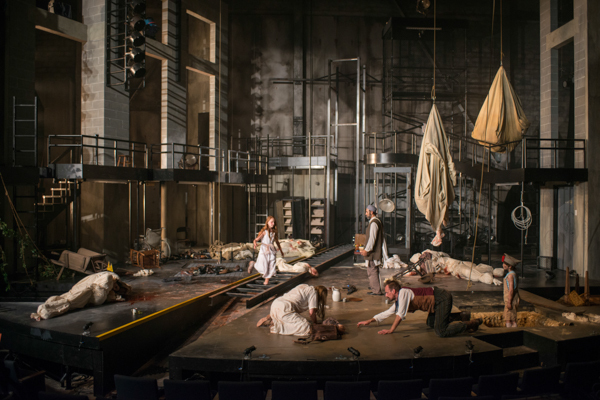 They kicked-off the project this spring with a production of The Copperhead, a drama set in rural Illinois, the first act during 1861-3 and the second act in 1903. It was written in 1918 by Augustus Thomas, one of the more successful playwrites of his day who’s all but forgotten now. I was curious to not only see a play set during a period of history I’m very interested in, but to see a popular play from the early 20th-century. It was a rewarding theater experience. I was surprised by how contemporary it sounded, free (for the most part) of any of the theatricality or melodrama I’d normally associate with this time period. The acting was strong, and while I thought the ending tied-up a bit too neatly, it was enjoyable. I’ll definitely be marking my calendar for City Lit’s future Civil War productions, including an adaptation of one of my favorite book, Confederates in the Attic by Tony Horwitz. Scilla or squill. Whatever you call it, this little blue early sign of spring is beautiful. The first planting of spring. A flower box for the front steps. JD and me, hanging around waiting for her dad to show up for our weekly dinner together. A CSO performance that included two dance pieces performed by the Hubbard Street Dance Company. Party prep. Did as much of the food preparation as possible the day before. My first fear was there wouldn’t be enough food for 60+ guests. My second fear was there wouldn’t be enough room to store it all. It all worked out–with two kitchens humming and four of us chopping, mixing, baking and preparing over two days. The big day finally arrived! My one-year cancer-free anniversary party! I could think of no better cause for celebration and wanted to give back to everyone who’d helped me in one way or another to get through the past year. A good way to give back the positive energy that I’d been the grateful recipient of last year. Everyone brought a craft beer to share and we had a big beer tasting that went on for hours. The photo above was taken very early in the evening. By the end, we had three beer buckets overflowing with a varied and impressive array of beer. I wanted to make sure everyone was well fed for the tasting and I tried a bunch of new recipes, including a brie and arugula sandwich with apple mustard, lentils on crostini, stuffed dates, spiced almonds, and stuffed cucumbers. Had the old standby favorite veggie pizza and for dessert, peanut butter cookies, bourbon glazed shortbread and a killer chocolate caramel pretzel bar made by a friend who’s a pastry chef. The evening was a success on all counts and it was great fun to see everyone in one place, together. A tad bit surreal, actually and unfortunately, over much too soon. Thursday morning I attended a rehearsal of the Chicago Symphony Orchestra as they prepared two pieces for that evening's performance under the leadership of Charles Dutoit. The first half hour was spent working on the Roman Carnival overture by Berlioz and after a coffee break, they worked for an hour on Panderecki's Concerto Grosso for Three Cellos and Orchestra. Both were lively and entertaining pieces, neither of which I'd heard before. It was so interesting to watch the back and forth between the conductor and various sections of the orchestra as they rehearsed segments alone and then combined them for the finished product. There was lots of note taking on music scores and conferring among orchestra members and you could see how sections of the orchestra worked together. Adding to the fun, I was able to sit in a box seat, off to the side and very close to the orchestra with a great view of the conductor. Great seats, great sound, great fun. Last Saturday I spent 4.5 hours at Lyric opera watching Wagner's Lohengrin. It wasn't as bad as it sounds. In fact, it was quite good. Typical of a Wagner opera, the curtain time was pushed up to six to accommodate the long running time, so many people at supper during the first intermission. We got stuff from our favorite Italian deli and had a picnic on the stairs. Reaping the benefit of cooking for the week on the weekend before. Monday's meal was a tasty quinoa salad and leftover mac & cheese. I'm forcing myself to wait a week before I make the m&c again. TV watching is so much more productive this way. My order from Halcyon Tea finally arrived, delayed a bit by Blizzardopolis 2011. I was completely out of Masala Chai (perfect for snowy days) so it was approaching crisis point. I purchased a couple of tea canisters to help me retrieve some counter space from the avalanche of silver bags of tea I've got going on in my kitchen. Also, a second hook handled strainer. The great thing about tea is (for the most part) you can get more than one (and sometimes as many as six) steepings out of one dose of tea leaves. Now I don't have to juggle caffeinated and caffeine-free teas in and out of the single tea strainer I had. My new favorite morning tea, is the fun to say Tung Ting oolong. It's like a little cup of spring. Found myself at Chicago Shakespeare Theater when a friend couldn't use her ticket. Was I lucky to see this outstanding production of As You Like It. I understood nearly all of it (seriously, Shakespeare is not my thing) and enjoyed it from start to finish. The acting was great, especially by the two female leads, and I loved the production design. And with the woodland setting, it was the perfect play to see in the heart of winter. I have lovely friends who send me handmade valentines.